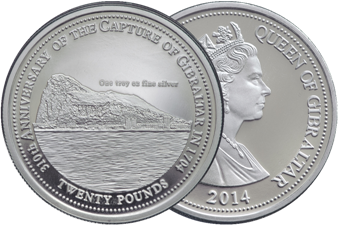 H.M. Government of Gibraltar is pleased to announce the issue of the 'Rock of Gibraltar' £20 circulating silver coin to commemorate the 310th Anniversary of the Capture of Gibraltar in 1704 and as part of the Gibraltar National Day celebrations. The obverse of the coin depicts the effigy of Her Majesty the Queen with the words "Elizabeth II Queen of Gibraltar" and the year of issue "2014".The reverse of the coin depicts an image of the Rock of Gibraltar and the words "310th Anniversary of the Capture of Gibraltar in 1704". The coin is 38.60mm in diameter and has been minted in fine silver with a weight of one troy ounce. A new £20 circulating coin was issued in 2013 by H.M. Government of Gibraltar. 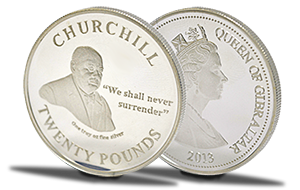 The 1 oz fine silver coin depicts Winston Churchill on the reverse and bears the phrase “We shall never surrender” which is an extract from the following paragraph of one of his defining speeches during the Second World War. ‘We shall defend our island, whatever the cost may be, we shall fight on the beaches, we shall fight on the landing grounds, we shall fight in the fields and in the streets, we shall fight in the hills; we shall never surrender’. The Government is delighted that Her Majesty the Queen has approved Her description in the coin as “Queen of Gibraltar”. This is the first time that the Palace has approved of the description of Her Majesty in such coinage as “Queen of” the issuing country in her Realm. One side of the new £5 coin depicts the effigy of Her Majesty with the words “Elizabeth II Queen of Gibraltar” and the year. The other side depicts the Rock of Gibraltar with the word “Gibraltar” above it and the words “five pounds” below it. A £3 circulating coin commemorating the 300th anniversary of the Treaty of Utrecht was issued by H.M. Government of Gibraltar in 2013. The coin is made from a metal alloy called Alpaca which contains a combination of copper, zinc and nickel. A design featuring the map of Western Europe with a representation of the Treaty of Utrecht document on the right and the Coat of Arms of the Province of Utrecht to the left is depicted on the reverse. The words ‘300th Anniversary of the Treaty of Utrecht’, ‘1713’, ‘Gibraltar British Forever’ and the value of the coin are also featured on the reverse. The Treaty of Utrecht was signed as part of the settlement in the War of the Spanish Succession in the Dutch city of Utrecht in March and April 1713. The Treaty was agreed on by several European states, including Spain, Great Britain, France, Portugal, Savoy and the Dutch Republic. In the Treaty, Spain ceded to Great Britain ‘the full and entire propriety of the town and castle of Gibraltar, together with the port, fortifications and forts thereunto belonging ... for ever, without any exception or impediment whatsoever’. To reflect Gibraltar’s long standing history with money, the first Gold ECU in almost two hundred years, intended for general circulation, was issued by H.M. Government of Gibraltar. A traditional design was used for the ECU where the coin depicts a mounted knight in full armour bearing an heraldic shield. Surrounding the knight are twelve stars which, at the time, represented each nation in the European Community at the time of issue. A thirteenth star appears on the knight's shield representing Gibraltar, as an EC member by virtue of it’s connection with the UK. 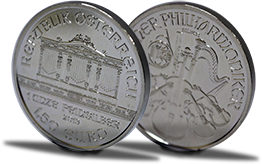 In 2002 the Austrian Mint in Vienna, known internationally for delivering exceptional coins for more than 800 years, produced the Austrian Philharmonic Silver Coin. The beautifully minted 1 oz silver bullion coin is considered to be the best selling silver coin in Europe. Designed by artisan Thomas Pensendorfer, the coin features an array of orchestral instruments and the Vienna Philharmonic Orchestra written in German on the obverse, while the Great Organ of Vienna, Golden Hall is depicted on the reverse. The net weight, coin’s purity, year of manufacture and legal value in Euros are also featured.